Offering you a complete choice of products which include flowers paint jute beach bags, leopard brown jute beach bags, orange red jute beach bags, jute fancy bag and colorful jute beach bag. 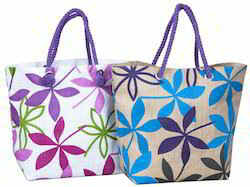 We are one of the widely acclaimed manufacturers, exporters and suppliers of Flowers Paint Jute Beach Bags. 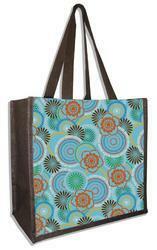 The offered flowers paint jute beach bags are special designed and printed to serve as carry bags for the shopped items. Our supplied flowers paint jute beach bags are highly liked and acclaimed by the clients, due to the optimal tearing strength and durability. We are one of the leading manufacturers, exporters and suppliers of Leopard Brown Jute Beach Bags. 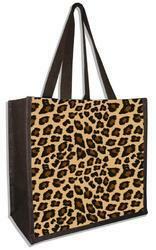 The offered leopard brown jute beach bags are uniquely printed and designed to display leopard prints. Our supplied leopard brown jute beach bags are highly liked and appreciated by the clients, due to the eco-friendly design and durable construct. We feel proud to introduce ourselves as the well-known manufacturers, exporters and suppliers of Orange Red Jute Beach Bags. 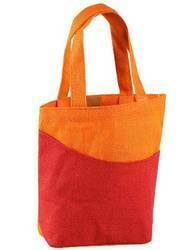 The offered orange red jute beach bags are designed for carrying and transporting goods and materials. Our supplied orange red jute beach bags are perfectly stitched for ensuring longer serviceability and durability. 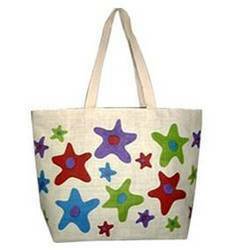 We are one the well-known manufacturers, exporters and suppliers of Colorful Jute Beach Bag. The offered colorful jute beach bags are specially colored and printed to display lovely themes and beautiful patterns. Our supplied colorful jute beach bags are highly liked and acclaimed by the clients, owing to the natural fiber and light weight design.